Megan Ranney MD MPH is an Associate Professor in the Department of Emergency Medicine at Alpert Medical School of Brown University. 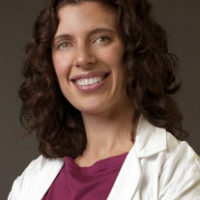 She is the Director and Founder of the Brown Emergency Digital Health Innovation program (www.brownedhi.org), as well as Director of Special Projects in the Department of Emergency Medicine. Dr. Ranney’s primary expertise is in developing and testing digital health interventions for high-risk emergency department patients. NIH, PCORI, and private foundations fund her research, which focuses on technology-based interventions for mental health and injury prevention. She also works to implement promising programs in the clinical sphere, and is an active teacher on social media, including Twitter and blogs. She holds a number of national leadership positions, including currently serving as a member of the Board of Directors for the Society for Academic Medicine and an editor for Annals of Emergency Medicine. She speaks frequently at national meetings within and outside of emergency medicine, and has appeared on national media ranging from Fox News to the Canadian Broadcasting Corporation.